Why is playground maintenance and supervision important? We all have the same goal in mind: raise healthy, happy, well-rounded children. Playground injury prevention is just one small ingredient of that recipe and it starts with maintenance and supervision on the playground at the park, school, or even at home. Keeping your playground maintained and establishing supervision processes is really easier than you think. That's why we created a Playground Inspection Guidebook to ensure your playground stays in stellar condition for years on end. After all, commercial playground equipment is a big investment so you want to make sure it's safe for children to play on and properly maintained. 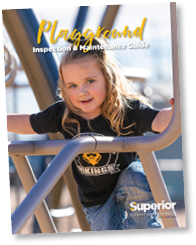 The Playground Inspection Guidebook emphasizes the need for proper supervision processes of children while they're having fun to keep them safe. It ranges from reasons why it's not a good idea to include benches on your site to mobile device distractions. © 2018 Superior Recreational Products. All rights reserved.